If you follow this blog for Bakersfield and Beyond, you may have discovered that there is not always a lot of planning that goes into the shows. The main objective is to go in there and play great music that is associated in some way, shape or form, with the Bakersfield Sound. We think we do a pretty good job. Tonight was no exception. We kicked off the show with some new tracks from JP Harris and the Tough Choices new CD, Home is Where the Hurt Is – great job JP! Something from Chuck Prophet‘s new CD, a great California singer/songwriter who happens to be performing locally at Rancho Nicasio on Sunday, August 31. Rancho is a great local roadhouse and music venue not far from Point Reyes Station in the town of Nicasio. Worth a visit, fer sure. Then we were off on songs about trucks. Hey, there are even MORE songs about trucks. Let’s make it a truck set! Oh, and since we were remiss about celebrating Don Rich’s birthday last week we played a few from Don. Oops, we haven’t played many women this evening….time for some awesome Bakersfield sound tunes from the ladies. Bakersfield and Beyond did not have a show during the recent on-air Summer Watershed Campaign, but it’s still going on! 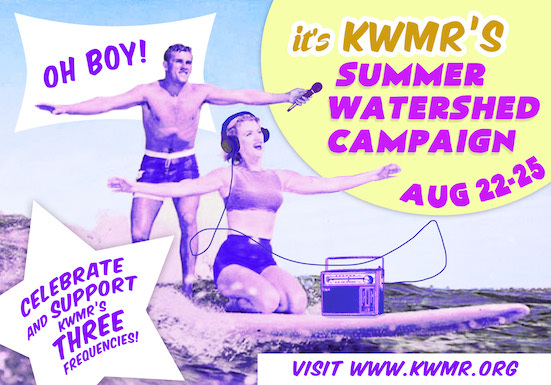 KWMR received a $10K generous matching grant and if you like the fact that this little radio station spins the Bakersfield Sound, show your appreciation with a donation and your dollars will be doubled. Gram Parsons Drug Store Truck Drivin’ Man Gram Parsons & the Fallen Angels: Live 1973 Warner Bros. Grateful Dead Truckin’ The Best Of Skeletons From The Closet Warner Bros.
Buck Owens born Alvis Edgar Owens, Jr., born August 12, 1929 and celebrated tonight on Bakersfield & Beyond. Because KWMR streams its music over the internet, there are some rules placed on the station about how many songs by any one artist we can play in any given two hour period. In particular, we can’t play any more than 4 songs by any artist, not more than 3 from any one album, and not more than 3 in a row. That might be a tough one to follow if one is trying to put together a 2 hour tribute show to Buck Owens. However, there are so many musicians who have covered Buck Owens’ songs, so many musicians who performed or wrote songs that Buck would go on to popularize, and then you discover that 2 hours is simply not enough time to honor the man. Check out the playlist and see for yourself the range of artists who have been under the influence of Buck. Dwight Yoakam My Heart Skips A Beat Dwight Sings Buck New West Records Inc.
Dwight Yoakam Only You Dwight Sings Buck New West Records Inc.